Many people suffer with the painful condition called temporomandibular joint (TMJ). Its symptoms include soreness and stress in the jaw, the jaw joint, and the surrounding facial muscles that control chewing and jaw movement. 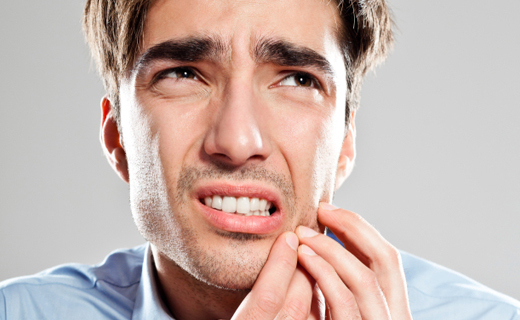 Doctors have always assumed that this dental care issue was caused by problems with the jaw muscles or tooth grinding. But recent research revealed that TMJ may not be induced by the mouth, but actually influenced by the mind. According to The Journal of Pain, a primary cause of temporomandibular joint (TMJ) pain may be depression or anxiety. This fascinating finding was based on five years of studies by a team of researchers at the University of Greifswald in Germany. They examined more than 4,000 patients for their level of TMJ pain and psychiatric health. Their research concluded that joint pain was more likely to be felt in people with signs of depression, while muscle discomfort tended to be felt by people experiencing anxiety. The researchers attributed their findings to the physical symptoms of depression and anxiety since these two psychological conditions can lead to more activity than usual in the jaw muscles, which can cause inflammation and muscle pain throughout the jaw area. An alternate explanation was that a chemical imbalance in the brains of people with depression and anxiety causes them to process pain in an abnormal way, according to Dr. Stefan Kindler of the department of oral and maxillofacial surgery/plastic surgery at the University of Greifswald. Previous research has associated TMJ with depression, but this study indicated a strong link between the signs of TMJ and the symptoms of depression and anxiety. While TMJ has typically been treated with medication or physical therapy, serious cases have called for surgery. An affordable dentist can recommend dental care options to treat the condition and meet any budget. But with this major revelation that TMJ may have psychological sources, we all may need to completely change the way that we perceive and relieve TMJ.